This post contains the handout of the lab I gave on explicit Custom Nodes in C# at the Dynamo User Group Computational Design Workshop in Sydney on the 2nd of December 2017 . You can find source files on GitHub. This workshop will teach you how to set your graph free by developing explicit nodes with a custom UI. This approach is more advanced and complicated than the Zero Touch one, but nodes built this way have the most flexibility and power. You will learn how to implement a custom UI, respond to other nodes and affect the state of the graph. You will also learn how to package your nodes and distribute them using the Dynamo Package Manager. The workshop be using Visual Studio and C#, an intermediate level of programming knowledge is needed, for additional information see the links in the Additional Resources section. In the previous lab we have seen how to develop Zero Touch Nodes, which are great to add custom functionalities, but do not give us total control over the node’s behaviour. In order to customize its UI, and to affect the state of the node and the graph an explicit custom node is needed. 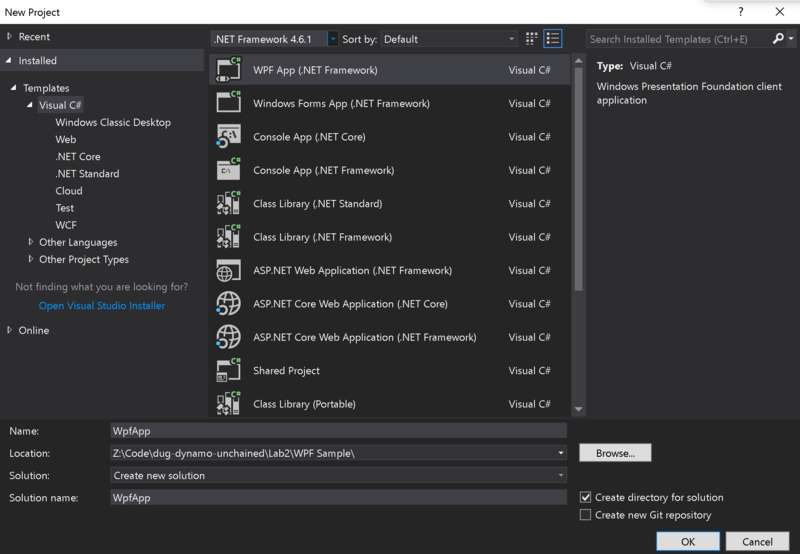 Explicit custom nodes are more complex and use Windows Presentation Foundation (WPF) a powerful framework for building Windows applications. Run the application and you’ll see it working! If you run the app you’ll see that as the checkbox is unchecked the button becomes disabled, we have bound the checkbox IsChecked property to the button status. Binding not only works between components, but also with the code behind. 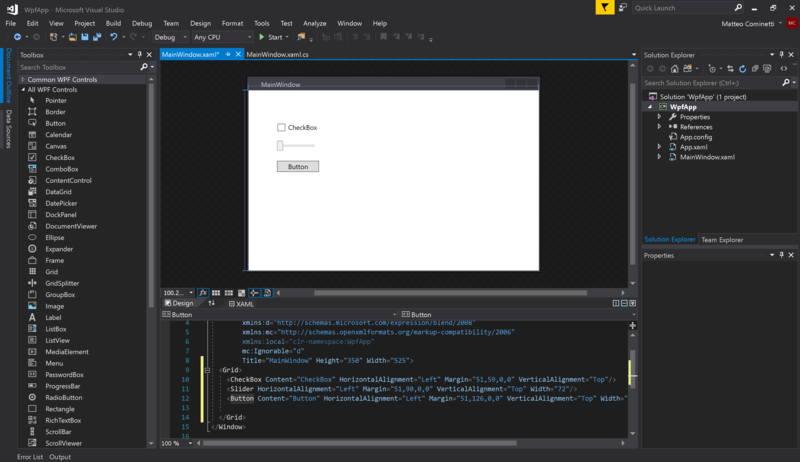 Let’s finally see how easy it is in WPF to create custom controls, right click on the project > Add > User Control and create a new one, I named mine MyCustomControl.xaml. Now, from the XAML panel replace the content of <Grid>...</Grid> in MyCustomControl.xaml with the one in MainWindow.xaml. 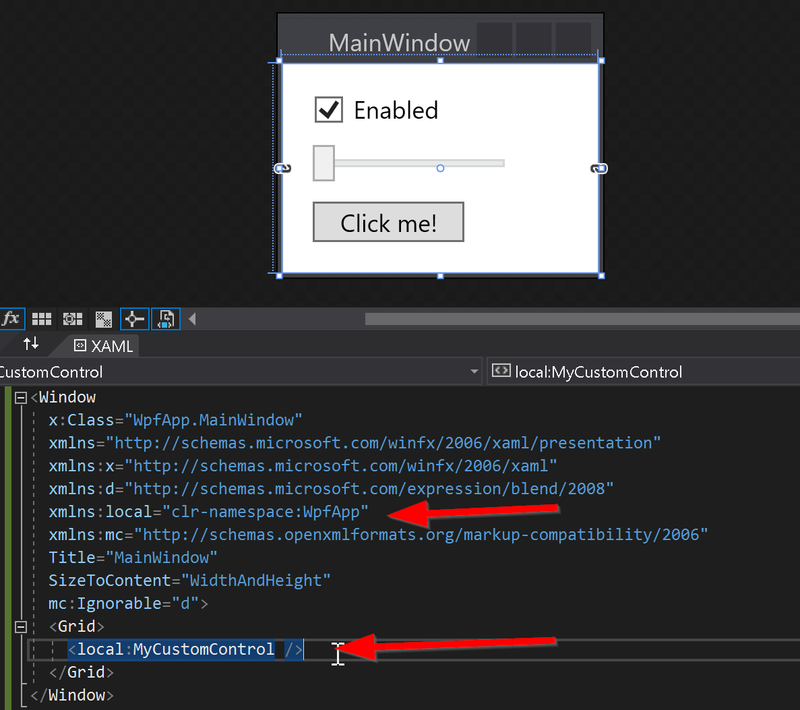 As do the same for our Button_Click function in MainWindow.xaml.cs and move it to MyCustomControl.xaml.cs. If you build and run the application you’ll see it behaves exactly how it did before. Custom UI nodes implement the NodeModel interface, the same way native nodes do. An interface is like an abstract base class, any class that implements the interface must implement all its members. Basically you’ll just have to add :NodeModel after the class name, and have certain functions in your class. In explicit nodes there is no need for a _DynamoCustomization.xml file, as the attributes on top of our class will define its category. You’ll also need to replace the namespace in those two files, from WpfApp to DynamoUnchained.ExplicitNode. The code above is assigning the custom view to the HelloUI NodeModel and binding the data. If you debug, you’ll see the node with the user control embedded, behaving as before, but without any input or output port. If you’ve missed any step you can find this completed part in the folder DynamoUnchained.ExplicitNode - part 1. In this final part we are going to add input and output ports to our node and interact with the graph. The following part is going to sound a bit confusing, but that’s how Dynamo works in the background. Now we can implement BuildOutputAst inside of HelloUI.cs. First right click on theDynamoUnchained.ExplicitNode project and add a reference to DynamoUnchained.ExplicitNode.Functions. You might have not noticed it, but with the current implementation the custom node is already affecting the graph. 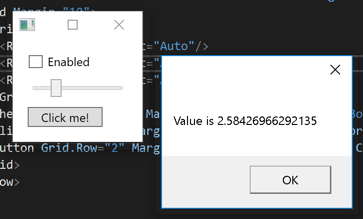 Every time the slider is moved its value changes, and it has a binding with the SliderValue property in HelloUI.cs which then calls the OnNodeModified() method telling Dynamo that one of its nodes has changed and needs to be recomputed. 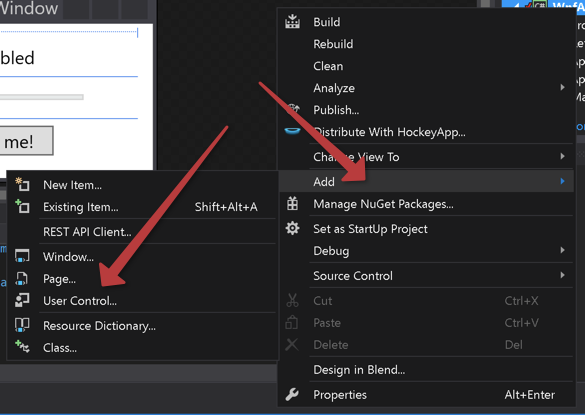 Publishing a package to the package manager is a very simple process especially given how we have set up our Visual Studio projects. Only publish packages that you own and that you have tested thoroughly! Publishing can only be done from Dynamo for Revit or Dynamo Studio, not from the Sandbox version. In the next screen make sure all the information is correct and that only the required dlls are being included (remember when we had to manually set Copy Local to False on the references?). 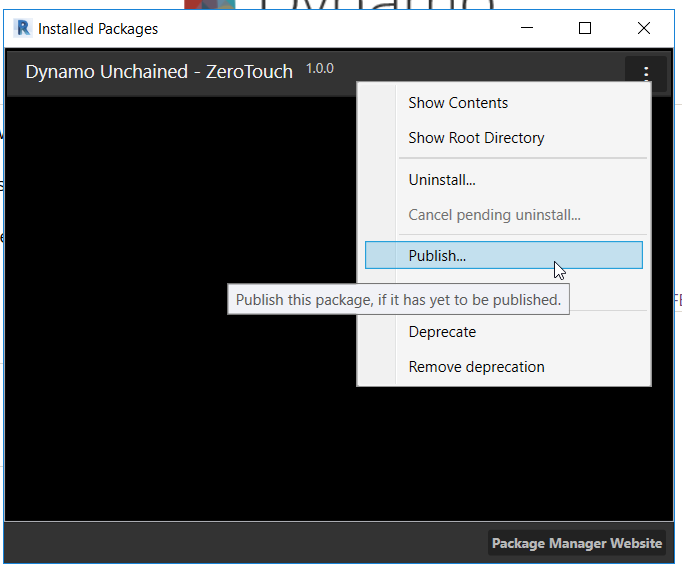 As you click Publish Online it will be on the Package Manager, to upload new version use Publish Version... instead. Also note that packages cannot be deleted, but only deprecated. We have seen the principles behind explicit custom nodes, and this workshop has given you the basis to get started with development. There are some technical challenges but also great benefits if you decide to build and use this type of custom node. 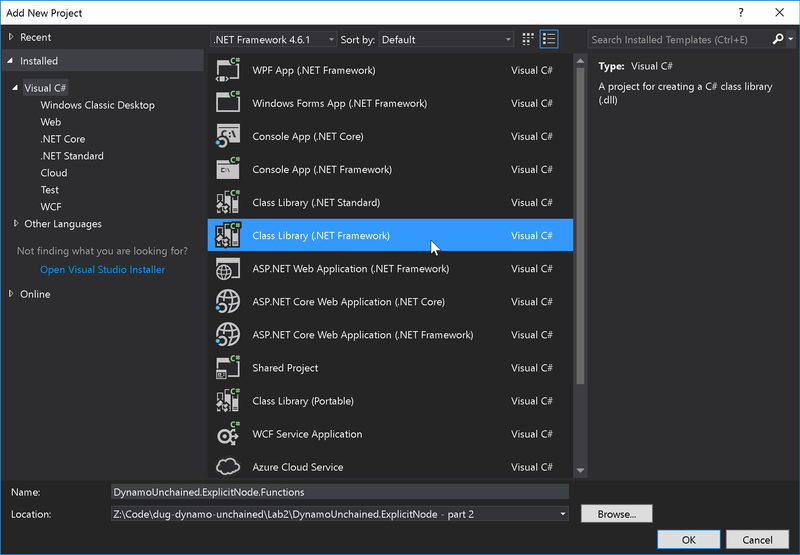 WPF is a very powerful and widely useful framework, you’ll be able to find lots of resources online and existing UI components to reuse. We have also seen how to publish your nodes online and contribute to the Dynamo community, if is a very straightforward process once you have set up your project correctly. Happy coding!